ODC Design were engaged by building owner’s Gillon Group to undertake fitout design, construction and project management services for new offices to accommodate Wormald, Victorian head office, who are a leading supplier of fire protection solutions in Australia. The new layout includes reception and waiting area, enclosed offices, conference rooms and a large breakout area comprising a kitchen. The front of house and breakout areas feature banquet seating which add to create a contemporary and comfortable environment for visitors and staff. The workspace is primarily open plan with informal meeting settings to facilitate a more collaborative approach among employees. Additionally the design involves the incorporation of hot desking which introduces a more flexible, mobile and task focused workplace. 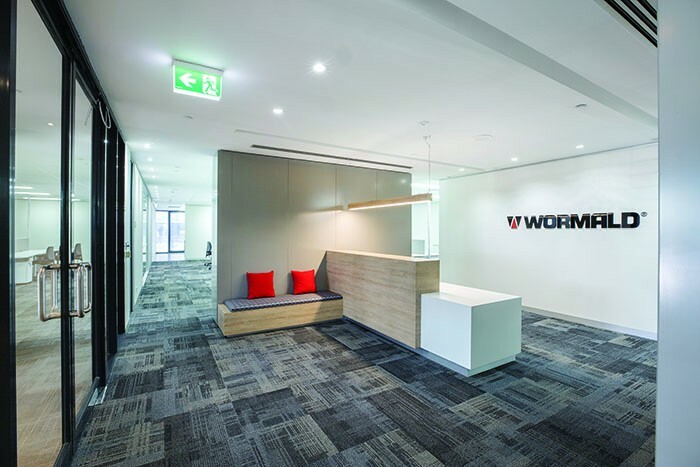 A specialised area for Wormald’s Simplex Time Solutions operations was designed to create a more methodical internal space including increased data outlets and revised storage systems. The 1,250 sq. metre fitout exhibits a modest palette of predominantly black and white with minimal contrast of blue in the breakout area. This design works well to integrate the company’s corporate identity of simple aesthetics into a functional space. A challenge for the design team was to work within very tight timeframes which was addressed with the proposal of materials and furniture that were already stocked or had less lead time. As a result, ODC Design’s design and project management capabilities ensured successful delivery against a fast-tracked programme. The design solution has provided Wormald with an efficient, coherent and modern working environment creating a calm, open and communicative synergy of space.